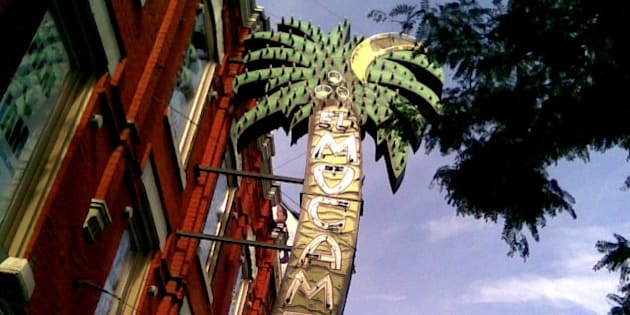 Although the sale of the building has not officially been inked, a famous symbol of Toronto's El Mocambo is already being auctioned off on eBay: the neon palm tree. According to the bar's official site, the famous palm tree sign was erected outside the venue in 1946 while the bar itself opened as a music venue way back in 1850. The palm tree idea was used to show the venue in 1946 as one of the city's first cocktail bars. As of Wednesday at noon, the eBay auction reached US$7,500 with 59 bids on the sign. "The El Mocambo is closing down and we must find a good home for this iconic sign," the listing reads with a photo of the sign accompanying it. "There is a reserve and buy must pay for the cost of taking down the sign & pay for his own shipping." A follow-up post added that in 2012 it cost $15,000 "just to refurbish it all new neon & transformers." According to Now Magazine owner Sam Grosso said he put the sign up for auction to "get something stirred up." He also said the cost of taking the sign down would be approximately $4,000 which is money he doesn't have. "I need to get rid of it," he told the publication. "The new owners want it off the building, so we gotta take it down." Grosso also is hoping the City of Toronto might become involved like they did regarding the famed neon sign atop the Sam The Record Man store which stood for several decades before closing its doors in 2007. Last July, Blog.to reported that particular sign will be reassembled atop a building on 277 Victoria Street near Yonge-Dundas Square, a short distance from where it originally was located. Last month Grosso was also considering donating the El Mocambo neon sign to the Rock and Roll Hall of Fame in Cleveland. "I'm hoping that the city would buy it and do what they say they're going to do with the Same The Record Man sign," Grosso said. "Or, I could raise enough money and hang it on Queen Street." The bidding will conclude at 2:03 p.m. local time on Oct. 31. In 2012, City-TV news reported the sign, which needed some work at the time, was being brought back to its original glory thanks to Grosso contacting glass blower Grant Farrell. "It's awesome that they're redoing the whole sign again and it's history," Farrell told City-TV I'm glad they're keeping it in neon and redoing it the exact same way as it used to be." As for the building itself, Grosso said the sale "is supposed to firm up" today, Oct. 22, at 5 pm but it's still a conditional sale, meaning the buyers (an unnamed retail outlet) could still "walk away." The venue, which has hosted gigs by The Rolling Stones, Elvis Costello and Queens Of The Stone Age among countless others, will see its final gig on Nov. 6.